What is Equistro Mega Base? 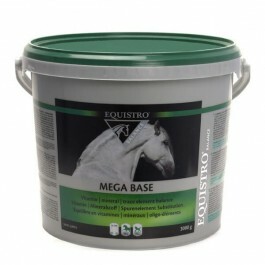 Equistro Mega Base contains 3 trace elements alongside fat-soluble vitamins. This formula has been specially designed to supply these key elements to the skeleton, connective tissue and joint cartilage, helping the horse maintain normal structure for as long as possible. The formula also contains calcium, phosphorus and prebiotics at adapted levels for overall well-being. Once a year, Equistro Mega Base batch is analysed for environmental contaminant, ensuring that the product doesn’t contain ingredients likely to make a positive doping test. What are the benefits of using Equistro Mega Base? What is in Equistro Mega Base? Calcium carbonate, Dead yeast of Saccharomyces cerevisiae species (ACTIGEN®) 16.6%, Lactose, Dextrose, Sodium chloride, Dicalcium phosphate. Additives/kg: Compounds of trace elements: Zinc - Zn, Zinc chelate of amino acids hydrate (E6) 4000 mg, Copper - Cu, Cupric chelate of amino acids hydrate (E4) 250 mg, Organic form of Selenium produced by Saccharomyces cerevisiae CNCM I-3060 (Selenised yeast inactivated) (3b8.10) 9 mg. Vitamins and pro-vitamins: Vitamin A (Retinyl acetate) (3a672a) 300000 IU, Vitamin E/all-rac-alpha-tocopheryl acetate (3a700) 4000 IU, Vitamin D3 (E671) 3000 IU. Antioxidant: Ascorbyl palmitate (1b304) 9900 mg.
How do I use Equistro Mega Base? Foals/ponies: 25 g (1 scoop) per day. To be mixed with feed. Is there any further advice I should know about Equistro Mega Base? Due to the presence of trace elements and vitamins with maximum set limits, administration must not exceed 350 g/ 500 kg horse/ day.